Realistic Grass 1 is a fully featured grass foliage pack that allows for advanced customisation of wind, mobile wind, interaction, color variation and snow. This pack was built with quality and optimisation in mind, to allow for huge densities without compromising on the performance of your projects. The pack is made up of 36 meshes, 18 desktop and 18 mobile. All the desktop meshes come with 3 LOD levels and 3 material instances to reach the highest level of performance and quality. The mobile meshes are a single low poly mesh to reduce the rendering load on mobile systems, and use a mobile friendly material to guarantee compatibility on as many platforms as possible. For more info on the info of the pack check out the Unreal Marketplace. Realistic Grass 1 includes 3 master materials, 2 material parameter collections and 12 instance materials. The 3 master materials are the main part of what makes the desktop materials work, changing things in any one of these materials will affect all of that material’s children. If you wish to change a default value across all of the materials children changing it in the master material is the fastest way to do that. Each part of the master materials is commented so you can change or copy and part for your projects! Instance materials are less expensive versions of their parent materials using them helps save on overhead performance costs, and they are also alot easier and faster to edit giving fast access to their parameters. For more info on instance materials check out Unreals documents found here. Material parameter collections are a way for blueprints to send and receive info from materials they are used in Realistic Grass 1 to tell the meshes where the player is and whether the player is moving or not. It is also used for the wind directional source values to the materials, this means that the values can be used inside of the materials. A good example of this is found in the HQ master material. 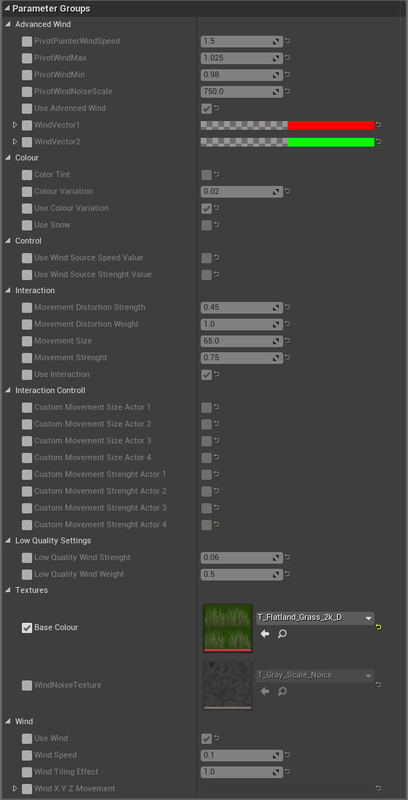 For more info on material parameter collections check out Unreals documents found here, and for more info on the advance wind system included in Realistic Grass 1 check out the video here. Realistic Grass 1 uses blueprints to allow any actor you want to interact with the grass meshes, or any meshes of your choosing. By accessing the DemoCharacter blueprint you can see just how the character blueprint sends the actors position to the material parameter collection. If you want to use your own character or actor blueprint, simply copy the blueprint code from the DemoCharacter blueprint to your own actors and watch as the interaction should work without any additional configuration. Below is a tutorial video showing you have to add interaction to any blueprint actor with movement. Common problems are in the blueprint containing the interaction blueprint code the material parameter nodes may not reference the correct/or any material parameter collection, this can be fixed by simply clicking the drop down menu on the node and selecting the material parameter collection it says. For any additional support with this please contact us at: Support@defusestudios.com or head over to the unreal forum post here. This pack includes 2 versions of each mesh one for mobile and one for desktop, the mobile versions are low poly and are optimized for low end systems and mobile devise, and the desktop versions include 3 LODs to give a good balance of performance and quality. 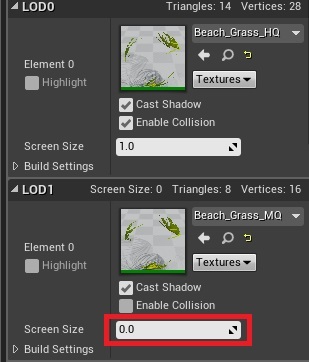 Disabling LODs is something you may want to do for cinematics or animations, this can be done by changing the values shown in the image below, note that this will have to be done with each mesh in the pack as there is no way edit the values for multiple meshes at the same time. Realistic Grass 2 features certain meshes that use camera facing materials. These meshes use a special material for their LOD 0 this improves performance and enables this feature close to the play. Enabling this feature is possible through the material instances for each grass type.